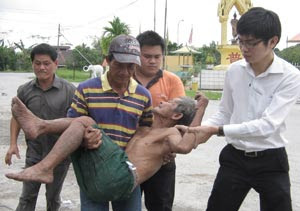 KUCHING - The police today apparently dumped a helpless old man by the roadside instead of taking him to a safe place. It all began at 7.00 am today, when residents at Desa Moyan, Batu Kawa said that an MPV had taken away an elderly man in his 60s, who was causing a nuisance in the area. The elderly man, said a resident, was not from around there and they had no knowledge of how he ended up in their housing estate. They wanted the police to take the man away either to the police station or the Sarawak General hospital. At 8.30, a group of men who were having a drink by the roadside stall at Jalan Stephen Yong were shocked to see an MPV stopping by the roadside and asking the elderly man to get out. Several people saw the man refusing to budge and he was instead pushed out. The MPV then sped off leaving the elderly man lying on the roadside with some injuries on his left forehead. Baffled by the situation, the group of men went over to find out what had happened but the elderly man was unable to answer them. He said he had no idea where he was. Angry at how an elderly man was dumped there, someone in the group called Wong King Wei, Special Assistant to DAP MP for Kuching, Chong Chieng Jen. Wong searched the old man and found a piece of paper with a mobile phone number. Thinking it could be the next of kin, he called and the person answering identified himself to be one corporal Hamdan. This 'corporal' Hamdan admitted it was he who put the elderly man by the roadside there as the old man had requested to be put there. Giving the corporal a lecture, Wong said he was disappointed and disgusted with the police's attitude. He then called for some friends who agreed to send the elderly man to the hospital. Wong then proceeded to lodge a report at the Simpang Tiga police station and wanted the case to be investigated. "It is a pure case of irresponsibility on the police's part. 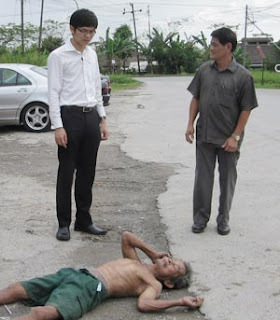 How can they dump a helpless man on the roadside. What if some knocked him down? Who will be responsible? At least take him to a safe place before finding out his next of kin," said Wong. Wong hopes that the police would do a fair investigation and appropriate action would be taken against those responsible.